Every day, natural elements such as sun, wind, and rain take their toll on your property. Dirt, pollen, mildew, mold, cobwebs, and leaves build up on the exterior of your buildings and in your gutters, resulting in an unsightly appearance and damage over time. Cary Homeowners and commercial businesses alike experience gradual wear and tear on buildings, decks, driveways, parking lots, siding, and more. 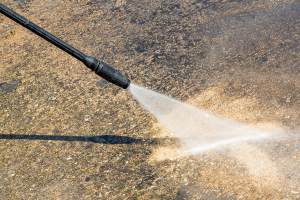 Fortunately, pressure cleaning or power washing can play a valuable, cost-effective role in extending the life and vitality of your property. Your home is your biggest investment, let us help you protect it and keep it clean. 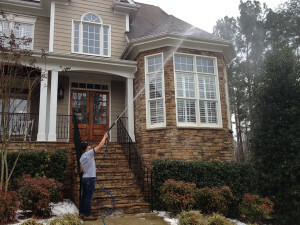 The climate here in Cary is perfect for mold and mildew to thrive, and your home is the perfect host. Left untreated, this brown, black, and green mold is not only unsightly, but over time can cause serious damage to your home. It will deteriorate your paint and siding, which could cost you thousands of dollars to repair. A low pressure house wash will eliminate this mold and prevent costly repairs. Low pressure is the key. We apply a solution to your entire home using a low pressure spray, which uses about the same pressure as a garden hose, ensuring no damage occurs to your paint or trim. This solution not only removes the mold, mildew, cobwebs and dirt from your home, but it kills the mold spores allowing us to simply rinse them off with a low pressure wash. By killing the mold spores, we prevent them from coming right back. Your home will be left clean, bright, and protected, just like it was when it was new!